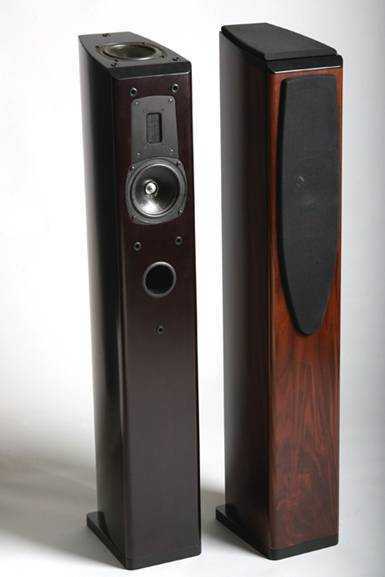 Our last review of an Aliante loudspeaker dates back to 2003 (that's 8 years ago!). At that time we reviewed the CNM Tower mkII model, a revised version of their previous CNM tower. The Italian Company doesn't renew the catalogue frequently, a release of new models or new versions of their products is planned only when it becomes necessary, i.e. when there's room for a significative step ahead. The Nova loudspeakers I'm going to review are an almost 100% new model, based on their CNM Tower. The price range is quite different, as the Nova cost something around 1300 € while the CNM's are available at 900 €/pair. The Aliante Nova is a sleek tower loudspeaker, two-ways system with double woofer, one of which faces the ceiling, being installed on the top of the cabinet, exactly where it was on the CNM. The Nova is unusually shaped too, with no parallel cabinet walls at all, in an attempt to minimize resonancies and stationary waves inside the speaker. An optional, not strictly necessary, pair of floor bases is also available at an extra cost (120 €/pair). The reflex port is placed frontally, so to minimize rear wall interactions. Which are the differences with the CNM Tower model? Well, first of all the Nova use a so-called isodynamic tweeter, which many might unappropriately call a ribbon tweeter. It is not a ribbon, actually, think of it as a mylar membrane with a printed voice coil. It is called isodynamic because the diaphragm gets driven over its entire surface (iso = equal). The midwoofers have been upgraded too, with a differently shaped membrane. Then, of course, there's a new crossover and a completely new cabinet. Moreover, gone is the possibility to use biwiring connections, which are available only as optional (+60 €). The position of the binding posts is very close to the floor (±10 cm), so you won't have cables dangerously hanging from the loudspeakers. The cabinet finish is definitely more refined than it was on the CNM Tower and it is evident these speakers aim for a higher target. As a well established tradition at Aliante, technical claims might be called understatements. For example, instead of reporting hard-to-believe 20Hz-20 kHz frequency response they declare their speakers are able to reach 45 Hz in a mid-sized listening room, whatever that means. The rest of the tech specs is available below. It should be remarked this appears to be an amp-friendly loudspeaker, with a good sensitivity (90 dB) and a reasonably high impedance (min. 6.5 Ohm). Low powered amplifiers welcomed. Size: 1080mm x 260mm x 170 mm. I've listened to these speakers in direct comparison with a similarly sized and priced competitor, the Cabasse Jersey I tested some month ago. My aim was to write a single article on these two speakers fighting one against the other. While listening and comparing the two I realized they were worth of separate tests. The results of the comparison test can be found right at the bottom of this article. My expectatons were high, considering the price difference with the previous CNM model. I wasn't expecting a completely new approach but the price difference of nearly 400 € (significative on a 900 € speaker) had to be justified. Even taking into proper account the fact I listened to the previous model 8 years ago already, the difference these Nova's make is remarkable. The first thing that can be noticed is the higher quality of the mid-high range: more refined, clean, detailed and easy on the ear. Certainly the new tweeter plays a key role here. The tonal balance of the loudspeaker hasn't changed much so it is easy to enjoy, again, that clever mix of openness and sweetness, care for the detail and lack of listening fatigue, all qualities which are Aliante's (and Mr. Prato's) fingerprints. There's coherence in spades, it seems impossible to detect the area where the woofers and the tweeter play together. Moreover, the top-placed midwoofer is completely acoustically invisible: you won't perceive bass frequencies coming from above. Certainly a lot of work has been done to find a new tweeter that blends so nicely with the midwoofers. With voices, an area where Aliante speakers have always performed very well, we can find an extreme detail and that extraordinary ability to let you understand words even when these aren't in your mother tongue. Quite surprisingly, this also happens with particular voices such as Sting's on So lonely ("Outlandos d'Amour", The Police, 1978). If you own this record, you certainly know this isn't an easy track to reproduce well. I haven't noticed any excess of sibilants, as the general tendency is to smoothen voices, though remaining extremely accurate and natural. The same approach can be found on guitars and string instruments in general: realism in spades, rich harmonic content and liveliness when required. On the other hand, with electric guitars, especially of the hard rock kind, this smoothing attitude can appear excessive: their sound might be too well-educated most of the times. The bass range, considering the small cabinet and the size of the midwoofers, delivers a very good performance. Articulation and energy aren't lacking when required but it is physically impossible to get lots of air pressure in the first two octaves. Actually, the speakers seem to prefer bass impact over extension of the frequency response. From time to time, traces of overblowing can be detected, a very common phenomenon in double-woofer tower loudspeakers. Of course, if you ask for more the midwoofers might seem not adequate, for example when trying to reproduce the lowest bass in Massive Attack's Angel (from "Mezzanine", 1998). Honestly, this is a torture test for most loudspeakers, in any price range. On the other hand even when the midwoofers seem grasping for breath, the quality of the mid-high range doesn't seem to suffer much, and I haven't noticed excessive turbulence noise from the reflex ports. With drums and percussions these Nova behave exactly like you'd expect them to do: sufficiently fast with the snare drum, a bit light with the kick drum, amazingly good with cymbals and high-frequency percussions in general. Take, for example, the train-like percussion pattern on Pat Metheny's Last train home (from "Still Life (Talking)", 1987): the perfomance is incredibly good: fast, clean, precise and in-tune like it happens only with higher class loudspeakers. Again, this new tweeter shines. Not surprisingly, the introspection level and the quantity of micro-details is very high and definitely on a much higher level than in the previous CNM Tower model. The energetic performance is good and constrained only by physical limits of the small midwoofers. Tracks with ultra-deep bass, played at high listening levels, become a severe test for the Nova's: while in the mid-high range there's no difficulty to reach high SPLs without distortion, in the bass you might be in trouble. Let me also point out that this happens when the SPL at the listening seat exceeds 100 dB, a very hard to reach situation for most audiophiles who live in an apartment, because of the NAF (Neighbourhoods Acceptance Factor ©) and WAF (Wife Acceptance Factor). Generally, I've had the sensation that these speakers prefer NOT to underline dynamic variations: they sound lively, but not violent, powerful but not walls-shakingly. In the microdynamics department, thanks again to the good isodynamic tweeter, the performance is extremely good: tiny details are retrieved and offered to the listener in a gentle-mannered way. In other words, they sound very precise and detailed but avoid flooding your ears with tons of musical information, that can become fatiguing in the long run. Quite the contrary, listening to these speakers for hours and hours is a real pleasure. If you're familiar with other Aliante speakers you should know they all perform extremely well w.r.t. soundstaging. Even the entry-level models designed by Mr. Prato succeed in building a realistic, wide and deep 3D soundstage which is also completely free from the speakers cabinets and drivers. These Nova's make no exception and build a stereo image which is extraordinarily wide, without holes between the speakers even when these are placed very far one from the other. The depth of the image is also very good and you can detect several horizontal virtual planes, behind and in front of the speakers line. The height of the virtual scene, thanks to the top-placed midwoofer, is remarkable as well but what really amazes is the sensation the sound comes from the space surrounding the speakers! This is so intense that is hard to find a similar performance even in higher-class speakers! I've NEVER had the perception of a sound coming directly from a driver, as it happens quite frequently. Of course, to experience such a magic soundstage you should be extremely careful when setting-up the speakers in your listening room. Do not compain with me if this magic doesn't materialize when you place the speakers close to the walls or with a shelf, a big TV or even the HiFi rack between them. Air is the password, here. These speakers aren't troublesome to set-up correctly: you can get a decent tonal balance AND soundstage without excessive efforts. To perform at their best (see above) you have to use many trials (and errors). Just to start with something, try to get the best compromise between impact of the bass range and depth of the virtual image. Once you get there, the 90% of the job is done. Into my listening room (your mileage may vary) the speakers benefited from some moderate toe-in (speakers rotation towards the listening seat). As usual, do not judge the speakers before 30 hours of break-in or so. As for partners, considering they are an easy and sensitive load, any decent integrated amplifier will be sufficient. A 20-30 watter would be enough on most listening situations. I'd avoid amplifiers with a warm or laid-back character, because these speakers certainly do not need to be smoothened. For this reason I'd avoid old-style sounding tube amplifiers. As a final step of the set-up, try using the felt sound absorbers (supplied and called acoustic shields) that should be placed close to the tweeters: sometimes these help to get a better focused 3D image. Finally, while I'd keep the dust cover of the top-placed woofer in place, I'd remove the front grilles while listening. Very few complaints from this point of view. The position of the top woofer isn't exactly ideal when it comes to dust protection. Even with the dust cover in place there's a small dust build-up on the woofer membrane and suspension. Nothing really serious, but any Nova owner should clean his speakers more frequently than usual. Moreover, I don't particularly like speakers where there are pieces to install by myself. On the Nova's you should install the floor bases that host the spikes. These bases aren't strictly necessary though, you can install the spikes directly on the bottom of the cabinet. The lack of biwiring isn't a real complaint, at least for me, since I hate biwiring. Thanks God many speakers manufacturers are returning to monowiring. The finish level of the speaker is very good, perfectly aligned with the price tag. Finally, the Aliante Nova's come with a complete and well written (English/Italian) owner's manual, with good advices on proper set-up. Pro's and con's depend mainly on your taste and on what you expect from a small floorstander. Certainly, if you are in the market for a speaker that can deliver a good impact on hard-rock recordings, perhaps this is not the speaker for you. And if obscure trip-hop atmospheres are your regular cup of tea, you might feel the need for some extra deep bass. High SPL fans with large listening rooms might be disappointed, as well. Aliante Nova's well-mannered personality isn't a good choice in these situations. Personally I'd have preferred a more aggressive behaviour, with more dynamics and impact, especially in the bass. Even some extra woofer control would be welcomed at this end. The Cabasse Jersey's, reviewed here on TNT-Audio few months ago, are similarly priced floorstanders, slightly bigger than the Nova's and equipped with two 17 cm midwoofers. The list price is slightly lower (250-300 € depending on finish) but their personality is very different, hence this comparison test has been very easy. The sound reproduced by the Cabasse's is generally bigger, certainly the two 17 cm woofers move much more air than the small 13cm units that equip the Nova's. The bass range, in particular, is much stronger, beefier and punchier. Its control is much better, too. Even the torture tracks where the Nova's grasped for breath are handled with ease, at higher listening levels. On the other hand, while the Nova's are much more forgiving on lesser recordings, the Cabasse Jersey's might tend to sound aggressive. The Italian sleek tower never sounds harsh or aggressive. Overall, the bass range is much better on the Cabasse (punch, control, power, physical impact) while the extension is almost the same. The Aliante's pay this extension in terms of control, though. The French speakers are better even in the dynamics department but the precision and the smoothness of the high range is a big plus sign for the Italian tower. And it shouldn't be forgotten the vastly superior performance in terms of virtual soundstaging. In this area the Nova's win hands down: the Jersey's fail to create that magic cloud of sound which surrounds the space between, behind and in front of the speakers. You can distinctly hear some sound coming directly from the tweeters, no matter how you try to set-up the speaker into the listening room. Setting them apart doesn't help much, since this builds up a hole between the speakers. At the same reciprocal distance the Nova still offer a coherent and compact virtual stage. Generally, I believe the tweeter of the Nova's is of much higher quality than the one which equips the Jersey's. Who's the winner? When all's been said, it should be not difficult to come to your own conclusions: all depends on what you're searching for. The Nova's are sweeter, warmer, smoother and more refined while the Jersey's are much more energetic and solid. The first will be at home with neutral HiFi systems (so to avoid an excess of sweetness) while the second might benefit from systems with a warm and smooth character. With respect to musical genres, if you mainly listen to jazz, pop and rock the Cabasse Jersey's should be your first choice. Otherwise, if you're mainly into acoustic and classical music try to audition the Nova's, you won't be disappointed. Don't take these advices too literally: both speakers can sound ANY musical genre, each one with its own preference. Finally, take into account the Cabasse Jersey's are bigger, while the Aliante Nova's are easier to place inside a small listening room. Aliante don't release new models just to issue a new catalogue every year. I appreciate this down-to-Earth approach. These Nova's represent a significative step ahead from the CNM model and conquer a well-deserved position among the best 1000€ range floorstanding loudpeakers category. Easy on the ear even after hours and hours of listening, these speakers have a distinct (though well mannered) character that can be perfectly adequate with most musical genres.